Work on the MU-2, Mitsubishi's first postwar aircraft design, began in 1956. Designed as a light twin turboprop transport suitable for a variety of civil and military roles, the MU-2 first flew on 14 September 1963. This first MU-2, and the three MU-2As built, were powered by the Turbomeca Astazou turboprop. Civil MU-2s powered by Garrett engines were certified as variants of the MU-2B, using the MU-2B type followed by a number. For marketing purposes, each variant was given a suffix letter; the MU-2B-10, for example, was sold as the MU-2D, while the MU-2B-36A was marketed as the MU-2N. The Japanese Self-Defense Forces are the only military operators to have flown the MU-2 in front-line service. The four C-model aircraft built, in addition to 16 MU-2Ks, entered service with the Japan Ground Self-Defense Force with the designation LR-1; they were used as liaison and photo reconnaissance aircraft. 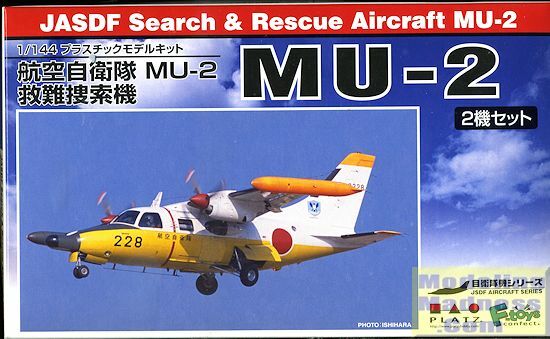 29 MU-2Es were purchased by the Japan Air Self-Defense Force as search-and-rescue aircraft and designated MU-2S. Additional equipment consisted of a "thimble" nose radome, increased fuel capacity, bulged observation windows, and a sliding door for dropping rafts. This kit has much in common with the two that was previously previewed over the last week. 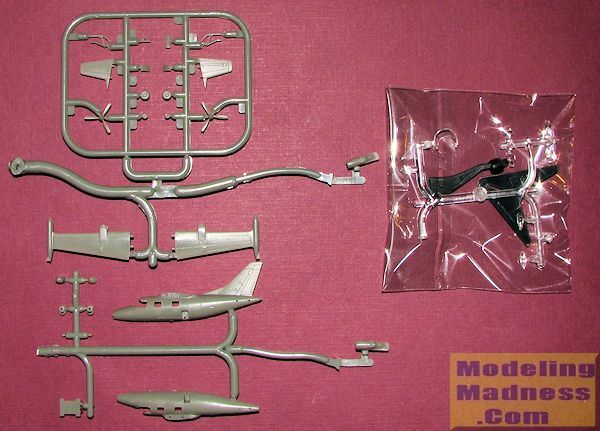 The kits are in 1/144 scale, there are two identical kits in the box, and each kit comes with its own display stand. This one has a small cockpit that includes a molded on instrument panel and seats. Cabin windows are applied from the inside and there are exterior bubble windows for the MU-2S version to install in place of the aft cabin windows. I'd leave those off until after painting. The flat pane windows must be installed before gluing the fuselage halves. Sings are a single piece with the engine nacelles being separate. One has an option of the thimble or standard nose section. The forward engine cowling is separate so that one can install the props and have them spin. The kit can be built gear up or gear down as one chooses. The struts and wheels are separate pieces with the nose wheels being quite small. There is a stand and a notch has been cut into the bottom of the fuselage halves to accept it. There is not much room in the nose for weight, so a stand may well be the best way to display this one, even with gear lowered. The alignment pins are huge as are the receptacles on the larger parts, making this one nearly a snap kit. Markings are for four planes. One is a civilian MU-2B, another is for an Army LR-1 without tip tanks so these will need to be cut away from the kit wings. Note that the tanks are underslung so one does not just cut off the tip. Also note that the LR-1 could carry the tip tanks, but the option does not have them. The other two are Navy SAR birds in very colorful markings. Both appear identical. One is an MU-2A from 1986 and the other is an MU-2S from 2014. The decal sheet is superb and includes the de-icing boots as well as the large fuselage color area on the civilian version. The large areas of da-glo will have to be painted on those options that require it as well as the black nose anti-glare panel, the inside of the engines and lower wings as well as the inside of the tip tanks on the Navy options. I have included a couple of photos of the LR-1 and MU-2 from my slide collection as a guide. Note also that the LR-1's markings are circa 1987 while those in the kit are from their initial introduction. Though I am undoubtedly missing some, to my knowledge, only two mainstream injected kits of the MU-2 have been done. 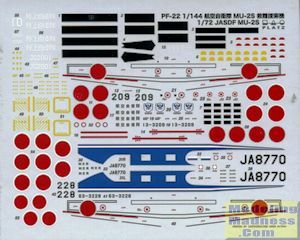 This one and a very old one in 1/72 from Hasegawa. It is nice to see one done in this scale and is a kit that should look just superb when finished. Thanks to Platz for the preview kit. You can find this one at your favorite hobby shop or on-line retailer.